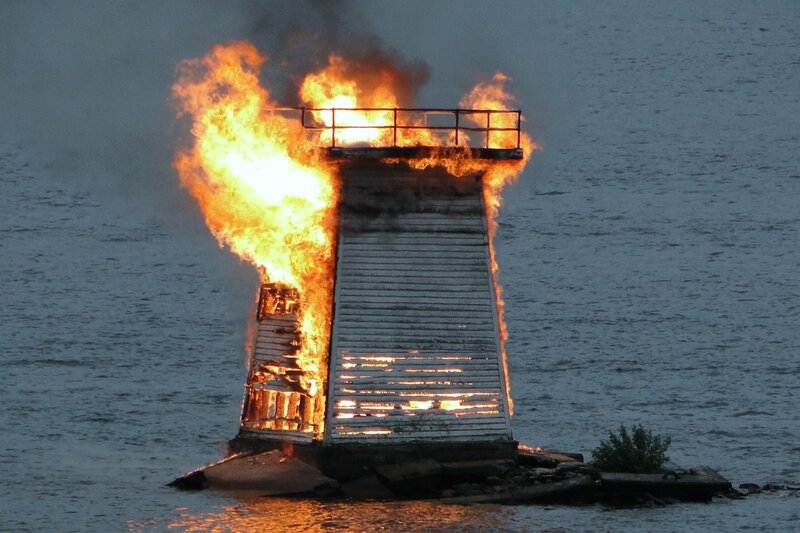 On the evening of July 23, 2018, a serious storm blew in, and an historic landmark on the St. Lawrence River at Cole Bay was struck by lightning and sadly burned to rubble. This Lighthouse is significant in that, it was the last remaining wooden Lighthouse of the 1850’s era on the St. Lawrence River. Long before the creation of the St. Lawrence Seaway, for many, many years, its prism light was used as a landmark for river navigation. It stood sentinel to a bygone era when the Lighthouse keepers would row out every night to light the navigational beacon at the top. It is hard to fathom the significant events the Lighthouse must have witnessed over the past 160 plus years. This Lighthouse pre-dated Confederation. Imagine no highways, as the St. Lawrence River was the main transportation route. In particular, this route was significant for the lumber-forwarding trade that built the cities of the Thousand Islands, Kingston and beyond, to the Great Lakes area. Had it not been for the Lighthouse, many more ships and people would surely have foundered in this area notorious for shoals. We would greatly appreciate any contribution to help construct a replica of our historic Lighthouse Landmark. Please give whatever you can to support this momentous project.